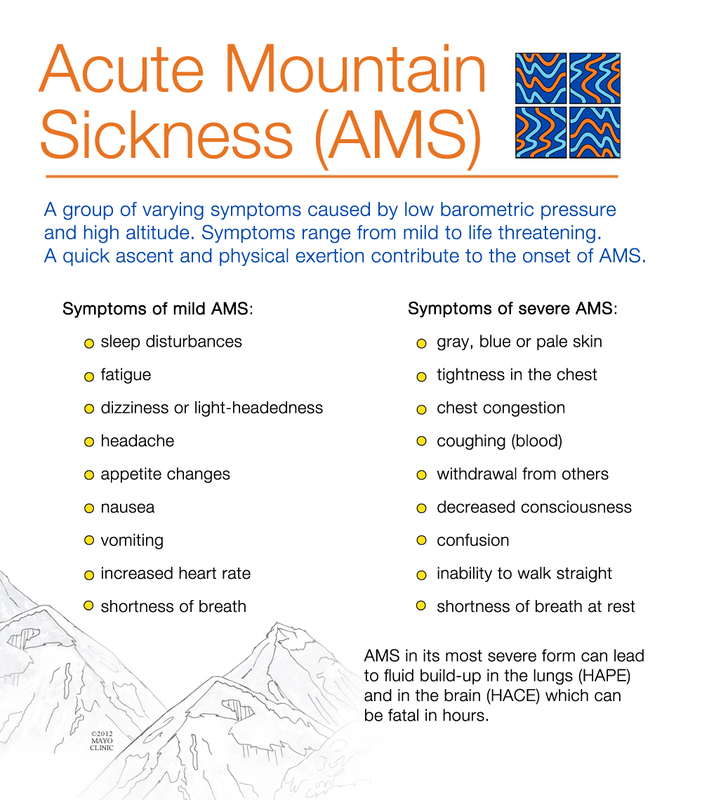 AMS is a form of altitude illness called Acute Mountain Sickness. Like many other conditions, it consists of a variety of symptoms in combination. It begins usually with a headache after an increase in altitude and may occur in conjunction with one or more of the following : gastrointestinal problems, fatigue or weakness, dizziness or lightheadedness, and sleep problems. The AMS score is a rating of 0 (for no symptoms) to 3 for the severe form of each symptom for a total maximum score of 15 . A score of 3 to 5 points means mild AMS; a score of 6 or more is severe AMS. If symptoms don’t improve with rest or become worse, the person must descend to a lower altitude. More severe forms of altitude illness are High Altitude Cerebral Edema (HACE) or High Altitude Pulmonary Edema (HAPE). HACE, in which fluid develops around the brain, is characterized by severe headache, poor coordination and loss of consciousness. HAPE, fluid in the lungs, is usually indicated by severe breathlessness. Both HACE and HAPE are life threatening and require immediate descent to lower altitude.